Last week Embrace used the UFU/NFU stand at Balmoral Show as a platform to launch its annual Remembrance Service. 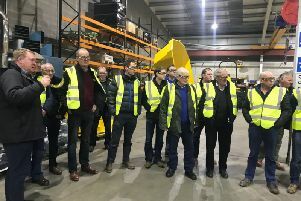 The launch was attended by a large number of Agri VIP’s from the farm organisations, HSENI, Harper Adams Ireland, agribusiness leaders and the agri media. The Ecumenical Remembrance service on the last Sunday of June each year remembers those lost and seriously injured on the farms of Ireland. The event now in its third year will take place on Sunday, June 26, in the Church of the Most Holy Rosary, Abbeyleix, Co Laois. In addition to this year’s service Embrace are adding a family weekend for young children who have lost either their Dad or young sibling in a farm accident. The purpose of this weekend is to do something fun with the kids and bring families from similar situations together in an attempt to help them connect with each other and share their stories.